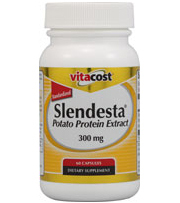 ﻿ Slendesta Pills Review: Is it Safe? This patented extract comes from potato fiber, and it is intended to trick the brain and stomach into thinking it isn't as hungry. Sounds like compelling science if true, clearly there must be more information as to how it works however. So to help satisfy demands for knowledge here is a full breakdown. The reason this review exists is to help you distinguish all the weight loss products that exist from best to worst. For people who are ready to diet this product exists, it essentially allows for you to have a caloric deprivation without the nagging feelings of being hungry. The extraction technique behind this process is managed through filtration in a water based solution which allows for the potato protein to be taken out. What it intends to do is release cholecystokinin which tells the body it is no longer hungry. Also it intends to prevent the increase of a high surge in blood glucose after you finish a meal. So the idea is to prevent hunger and prevent the bad feelings of unease after finishing a meal. Apparently the company ran studies on over 500 people which was shown to increase the rate of fat loss and a decrease in waist size. Well another study performed by an independent panel named the EFSA came up with different results. They are the equivalent to the FDA and they stand for the European Food Safety Authority. They performed studies using the recommended dosage of taking this extract 30 minutes before a meal twice daily. The participants did not add diet and exercise and the results were not in favor of this extract. The EFSA concluded there was no link between this ingredient and weight loss. To establish the results you need there are options readily available for weight reduction. This extract is fabricated in a GMP safe facility ensuring quality control. Independent reviews have shown this product to not assist in losing weight. One can speculate that the caloric deprivation alone could have been the reason why the company concluded this product would reduce weight. Since the EFSA has no benefit good or bad on this product existing, it really rained down a hard blow on the use of this product. Many other companies have added it to their supplements for the stated reason of improving overall body weight loss, but unfortunately unbiased studies have shown no real benefit. Looking at the details it appears there is more information required. Find out for yourselfwhat you can gain from valuable weight loss pills. It would have been great if this all natural extract actually produced some noticeable effects. However looking at the studies performed outside the company leaves too much to be desired. Overall the independent consensus has not see any noticeable reason as to how this protein extract could benefit someone. There are more satisfying offerings available now. It was good that the product did not show any harmful side effects however, so there is that. To make weight loss come to you in the way you like it, take a view at the top rated pills.